One of the largest and most popular parks in the City of Miami will be getting improvements, and a grant may help spur on the renovation. Jose Marti Park, at 351 SW Fourth St., lies next to the Miami River and in the shadow of an elevated I-95 freeway. The Van Alen Institute, a New York City 501(c)(3) not-for-profit, has awarded the city a gift and a grant for the design development phase of a new general plan for the park, which anchors the east side of Little Havana. City commissioners are to consider acceptance of the gift and grant today (11/16). The institute collaborates with communities, scholars, policymakers and professionals on local and global initiatives to investigate the most pressing social, cultural and ecological challenges of tomorrow, according to Jane Gilbert, the city’s chief resilience officer. In a letter, Ms. Gilbert recommends the city accept the in-kind service donation from the institute for a new general design of Jose Marti Park to address flood risk in Little Havana. The institute is donating its professional consulting for advising, providing input, assisting with community engagement and other services to assist the city with the design phase of park improvements. The gift is about $120,000 of in-kind services, plus $60,000 in funds to compensate the design team selected through the city’s request for qualifications for the conceptual design. Commissioners will be asked to approve, by four-fifths vote, City Manager Daniel Alfonso’s recommendation waiving competitive sealed bidding as not being practicable to accept the donation of services and money. 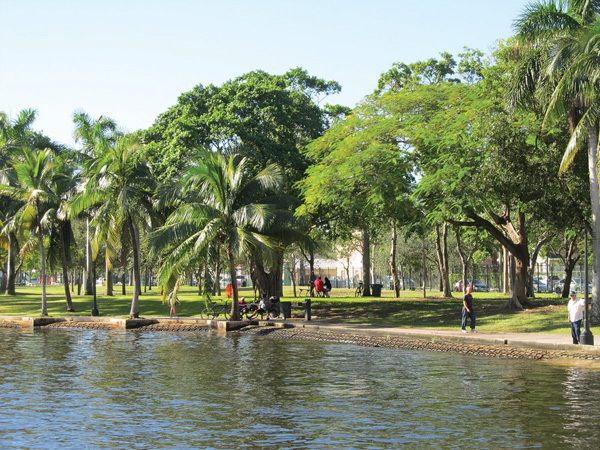 A background memo from the manager’s office says the design phase would involve developing a new general plan for the park, taking into consideration increasing flood risks associated with sea level rise, unique cultural heritage of Little Havana, increasing use related to developments surrounding the park, and parking, transportation and access issues. The process would research and analyze site and contextual elements, identify opportunities and constraints, engage stakeholders and community residents, and recommend a phased approach for implementation. The institute’s consulting includes assistance with the development of the city’s request for qualifications to select the design team, assistance with community engagement, and other tasks, the memo says. The park is home to a public riverwalk the length of the property. On the southern end of the park is an elevated seawall. There is no seawall on the northern portion and tidal flooding floods the riverwalk, a green space area and beyond. Once the design is complete, the cost of much of the improvements is expected to be paid as part of a public-private partnership between the city and a developer who owns the property next door on the river, CG Miami River LLC. A plans calls for multiple towers offering residential, hotel, offices and retail space in a project to be called simply Miami River. City commissioners approved the partnership and the project in October 2015. The developer has committed to millions in public benefits to the park as part of a five-phase development. The agreement calls for the developer to renovate a pool and restroom, demolish gates, plazas and structures, and construct a children’s interactive fountain and playground and adult game area, outdoor built-in gym, plus add new equipment, a canoe launch and concession area, and improve the park with landscaping, hardscaping and signage. A list of estimated costs attached to the development agreement shows that contributions to Jose Marti Park, including seawall repairs, riverwalk and Art in Public Places, totals more than $6 million. Jose Marti Park offers swimming, baseball, basketball, a playground and a gymnasium, along with after school programs, summer camp, spring break camp, winter camp, ESOL classes, arts and crafts for seniors, computer classes and more.